Zionist gunmen in Gaza shot a young Palestinian man in the chest as he was martyred later. Rescue teams were able to transfer body of the Palestinian youth to Al-Aqsa Martyrs Hospital in Deir al-Balah, according to local sources. The Palestinian Ministry of Health has declared the identity of the martyr as Muhammad Ala'a Mahmoud Abushabarin (aged 20) and a resident of Rafah. The sources said Zionist forces were shooting at a group of Palestinian youth east of Moghazi camp on Thursday as a number of them were wounded. 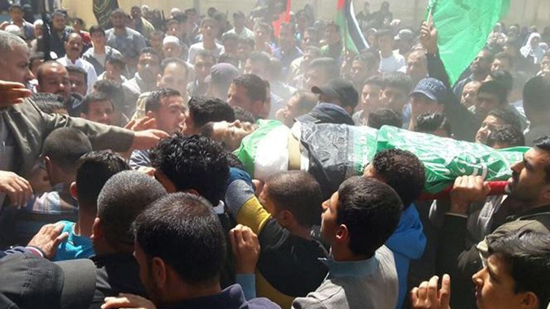 With the martyrdom of the young Palestinian, the number of martyrs of the 'Great March of Return' rose to 233 since March 30, of whom 43 were children, five were women and three were from relief forces, while two were journalists. Also, 24,000 people were injured in the March.